cryptoengineer wrote: In addition: I work in cybersecurity. I find the computerized touch screen voting machines a security nightmare, and want them banned. All ballots should be on paper, and available for a manual recount. First off, the machines were certified by the gaming commission to meet security standards of the slot machines. Not too many states can say they care about the vote as much as they care about the top money making industry for their state. Even fewer can say they have the security of gaming machines in Nevada!! 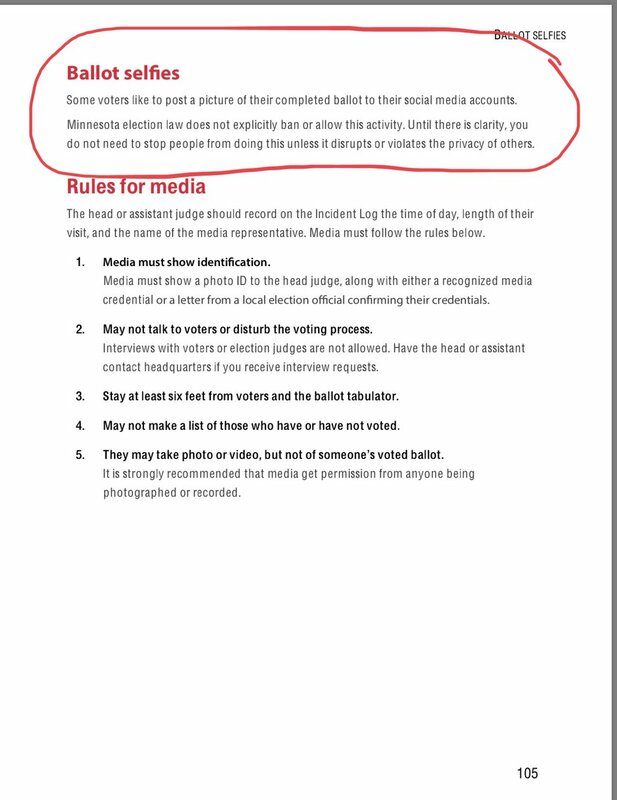 Second off, there was a printed, physical paper ballot recorded that you could see, had to confirm, but could not touch. There was box with a clear glass window on the side of the machine with a printer at the bottom and what looked like the old adding machine paper or receipt paper and when you finished out your ballot it would print a window's worth of votes to review, scrolling the whole thing under the glass within the box. If you did not approve it as it was printed, it would void the entire thing out and re-print your corrected ballot. When you confirmed it as correct, it would scroll up into the machine until the last vote was hidden and leave a nice black space for the next person who came in. You KNEW how the machine recorded your vote, and there was a paper trail if need be, but you still had the convenience of electronic counting. Only real issues I heard about were it took a little longer to review your vote (takes too long!) and the usual complaints about touch screens. That's the kind we have in Ohio, too, last I checked (which would have to have been 2014 at the latest; in 2016 they used paper ballots because of an un-elaborated-on "security issue"). Thing is, that's not stopping people from hacking them (or just rigging them at the factory, depending on how cynical you want to be and about whom): People in Texas who got to vote early have started reporting that their votes are being changed prior to the confirmation step. As in, whoever did it is confident that enough voters won't bother checking that it'll be worth the blowback from the ones who did. With US absent voting, how long does the "home" election district wait for possible absent ballots arriving before totting up the votes and declaring the result? In the UK the deadline for absent ballots is exactly the same as for in-person ballots, 10pm election day. All and every ballot arrived by 10pm is then counted and the result declared. That wasn't a problem with analogue paper. It was a problem with trying to digitise it. A proper system should already have been in place auto-sorting any papers that had not been readable, as any machine-readable vote, into a pile that could be assessed by human eyes. At leisure, but planned for. The machine-reading reject rate being an instantaneous guide to if more help needed drafting in, or a full-blown issue raised without having to go the whole way to the courts to bounce around some more. For multi-question (single-choice per question) sheets simplest to dump all 'incomplete' ballots for checking,with false-positive on genuinely un-voted-for options, but still fairly simple to dedicate a reading machine to take 'any or all' rejects and assess Q1 into votes (tallied on Q1 only) or no-vote (human checker/tallier on this line only), feed back in for Q2 (ditto), etc. If it was so totally failing with hanging and pregnant chads (falling upon whatever globally pre-agreed method was of establishing a voting intent*) that it overloaded even the worst-case scenario then this would have been noted early. As would inconsistencies in failure rates between districts (say those with a certain demographic bias had been issued punchers with slightly back-adjusted punching prongs..?) and a properly transparent process would have made that obvious. That different systems were employed across the same state (because nobody thought there might be a planned state-wide ballot at some point, so they didn't have time to ramp up the resources to be consistent?? ), and that that distribution was demographically biased, was also on the verge of suspicious, probably. There's no problem with paper or electronic voting that can't be out-problemed by a bad implementation atop of it, but right now we have better ideas about how to not badly implement paper. The only better system might be the ball-casting method**. * I would have said a single clearly distorted punch-point (unrivalled by any other punch-point) should suffice. With perhaps the earlier-term 'pregnancies' perhaps being squirreled away/brought to the central count-point for consistent adjudication. But if there's a noted intention, it should count, even if a machine is too dumb to note it. Quizatzhaderac wrote: In my view, a person is a resident of the state of their college if they live in the dorm. Most states give college students the option of registering to vote at their college address, but many students consider their permanent address to be "back home" and even retain their home-state driver's licenses and other documentation. Forcing them to vote at their college's location would cause a number of issues. sonar1313 wrote: Personally I think absentee voting should be limited to people overseas. If you're out of state, you can have a ballot mailed to you, bring it sealed to a local polling place, open it there, and have them transmit the result back to your clerks. My state is voting on no-reason absentee voting this year. I'm voting a hard No. It'll pass anyway. I'm guessing that you are a fellow Michigander. If so, hello! Unfortunately, I have to disagree with you on Proposition 3. Did you know that some County Clerks refuse to grant an absentee ballot for being out of state for college on Election Day? I've seen that situation happen to people I know. It was hard enough to get mine while I was out of state and I couldn't change my permanent address away from my mother's house without screwing up my financial aid so I couldn't just register where I was without having to drop out of school. No excuse absentee voting will remove the clerk's ability to refuse an absentee ballot to a registered voter for any reason. Secondly, the reason that you can't simply turn in a ballot from one state at a polling place in another is that elections are officially handled at the state level in the Federal Constitutional Republic that is the United States of America. In some States, there are even differences from County to County in the machinery that is used and the 10th Amendment prohibits the federal government from directly controlling them. The best way for the federal government to try to change this would be to offer to fund all federal elections if they meet a certain minimum standard but, as with the Medicaid Expansion, some Governors would probably balk and refuse the money anyway and we'd still have a patchwork of systems. As you stated in your post, the only way to truly fix this problem would be by decree but, since we do things democratically here, that's not really tenable so, we have to wait for each state to come around individually. You guess correctly, fellow Michigander....and further points for the correct demonym as well. Anyway, I think of Prop 3 as the old "if all you have is a hammer...." situation. We have a screw and we're going to beat it into place with a hammer. We did the same thing with term limits 25 years ago. I love the idea and intent and philosophy behind term limits, and I detest the results we've gotten, and now there's no way to change the mistake without another ballot proposition. I'm not inclined to change the constitution. If there's a problem with clerks, let's train the clerks and enforce the existing laws rather than using a blunt and almost entirely irreversible instrument, which is likely to cause unforeseen consequences that can't be fixed. sonar1313 wrote: - US voting would take place on Election Day only. What about special elections? Primaries? School budgets? - National holiday which is absolutely required for all but essential people like emergency personnel. So after you vote, what do you go do? Can't go shopping. Can't go to work. Can't go to an amusement park. Can't visit family (no gas stations open). The media is constantly speculating on things like who benefits from more early voting, and that is bad. Early votes should NEVER influence later ones. That's not what's happening. No one knows the results of the early voting. The reason Democrats benefit from early voting is because early voters are more likely to be Democrats. If you expand early voting, that effect would decrease. I don't think special elections usually need to be held. If we can have a line of succession for the Presidency itself, we can certainly stick it out under an appointed representative for a few months until the next regular election. School budgets can be voted on at the same time as everything else. On primaries you raise a good point, but then I've always had a problem with spending all this public money and time on subsidizing the decision process of some private parties but not others. That's a process that I think needs a whole separate look at reforming. Gas stations would certainly be open, otherwise the ambulances, fire trucks, and voter shuttles would have a tough time. And if the worst negative consequence of a national mandatory holiday is we all have to stay home for a day, we'll manage. No one knows the results of early voting, and it still doesn't stop the media from speculating. Which in turn influences later voters. If it didn't cause some thorny First Amendment issues, I'd ban polls, too, for the same reasons of influence. ucim wrote: How does the US enforce secrecy for mail-in ballots? I don't think it's possible. Not a big deal so long as mail-ins are a small enough minority, but if we go 100% mail-in, the entire idea of secrecy can be tossed. We don't. We enforce secrecy on on-site voting and we restrict mail-in voting to those with special needs. Three factors prevent this loophole being used for vote buying 1) the old political machines that would literally buy elections have been dismantled, establishing new ones requires a lot of effort and high level collusion of the major political parties. 2) Buy-able votes are a minority; you can't really keep an effort to buy a large minority of votes secret, so the attempt at buying votes will prejudice the majority against you. 3) Mail-in voters are usually not co-located to their district, making organization more complicated. If it were legal, some kind of digital exchange could probably work; but good luck matching a sold vote in Kabul with a buyer in Des Moines without leaving a paper trail. Quizatzhaderac wrote: ...and we restrict mail-in voting to those with special needs. Right. And if we open mail-in voting too wide, we lose this safeguard. That is all. With early voting, the early votes are NOT counted prior to the Election. However in Early voting and to some degree in absentee voting if it comes in early, then it is possible to know WHO voted. In states where voters register with a particular party that can serve as a reliable guide as to how overall voting is going and shows trends etc. Especially if the voters are repeat or consistent voters then there is a high probability of them voting in the registered party. With ballot selfies... I had not really considered the intimidation or vote selling scheme possibilities. I also wish our state DID have paper audit trails on the voting machines. It becomes especially important in close elections. if an election is wildly one-sided in polls then there will be massive questions if it shows up different. In a close election. It only takes a minor twerk to change the results and that would be almost impossible to prove without some kind of audit trail. Quizatzhaderac wrote: That's another, separate thing. In my view, a person is a resident of the state of their college if they live in the dorm. In my view, living in the dorm is the weakest case that an out-of-state college student has for residency where they study, since I've never heard of a school where the dorms are open year-round. If you live in the dorms, you necessarily live somewhere else as well. This isn't to say I would prevent students who live in college dorms from voting in that jurisdiction, just that it's a weaker case than someone who is (presumably) paying rent year-round. People should be allowed to vote in any one jurisdiction where they can make a reasonable case that they live. Out-of-state college students can make a reasonable case for two different places, and should be allowed to choose between them. sonar1313 wrote: - National holiday which is absolutely required for all but essential people like emergency personnel. Have a Sabbath. Do your necessary work on the day before. I read and hear "God's own country" in the media, so you may as well start being worthy of that title. In Germany, we vote on Sundays. sonar1313 wrote: First thing I'd do if I were in charge is move election day to a weekend. That would privilege people with white-collar, M-F jobs. It would make it easier for them to vote while not making it any easier for the working poor who often have multiple jobs, with weekend hours. That's why it's important to have Sabbath days. I'm not saying it won't happen (or hasn't already happen), just that it's a delay and an obstacle that would have to be overcome before it becomes a major issue again. Mandatory sabbath laws wouldn't just restructure service jobs, but it would eliminate a good fraction of them; being as that the point of them is for someone to be working while other people aren't. TALLAHASSEE, Fla. (AP) — With one day left before Election Day, more than 5 million voters have already cast ballots in the battleground state of Florida, and records show Democrats have the edge. There's no friggin' way this kind of thing should be out before Election Day, clearly influencing those who haven't voted yet. I could come up with reasons either way that it'd energize one side or the other, but any kind of influence that early voters might have on later voters is plain wrong. sonar1313 wrote: There's no friggin' way this kind of thing should be out before Election Day, clearly influencing those who haven't voted yet. I could come up with reasons either way that it'd energize one side or the other, but any kind of influence that early voters might have on later voters is plain wrong. Worse, it might even coat them in zinc. I wonder [if anybody has / how many people have] been fired for posting their votes? I mean, that probably wouldn't explicitly be the reason for firing somebody (unless they work for a campaign, maybe, and they could say "not a team player" or some such...) but I think most employers have enough info on their employees (are they really monitoring my internet usage right now like they say they are?) that they can come up with a good reason to fire somebody if they have a bad reason they really want to use. Archgeek wrote: Worse, it might even coat them in zinc. Funny you mention that, I keep having to clean the zinc out of my pockets every time I go to the store. Speak for your own state. In MA, mail in ballots are mailed in a double envelope, with the exterior certifying who the voter is (and thus, that they are legal to vote), and the interior envelope contains the ballot. The two are separated (without the ballot envelope being opened), by election officials, who work in teams, same as at our polling places (so they can check each other). The inner envelope is than processed as part of a larger mass by different officials. Thus any individual person's votes remain secret. So it will galvanize them? I think the point was...the nefarious influence can check your ballot to make sure you vote 'correctly' IN your home (or workplace, or social club, or, etc.) before you put it in the secret envelope. And then they take the ballot and mail it, so you don't get a chance to double cross them. Instead of the "make it a federal holiday" proposal, consider this alternative: Replace Election Day with Election Week. Ensure that every community has a location that can stay open as a polling place for seven days straight. Encourage people to vote at their earliest convenience anyway, because half the reason for this is that if something goes wrong, you have the chance to fix it and ask people to come back tomorrow. Require every business to allow every employee one full day out of this week off, minimum, and make it clear that two half-days also count and are preferred (see above). This also means that if something like the rigged Texas machines comes up on the first day, the state election commission can be forced to allow concerned citizens to come back and take a do-over, automatically erasing their previous votes. Even in old biblical times people would hire foreigners to do things. Also, I think only specific types of work were forbidden; which was most types of ancient work, but not all. Also, I'd say even a version of "as much of a sabbath as the modern world allows" is a bad idea, as it will necessarily become classist. Who will work? Those doing important things. Will the unimportant people work? No. The solution to that is…? I mean, who wouldn't want to be 'stoned' six days a week. Right? Oh man.... I mean, you make some good points, but a whole week of election coverage? People might start stabbing their own ears out. Plus, schools are very common voting locations and a week off school might make all the munchkins happy, but not the taxpayers paying to educate the munchkins. Or parents. Replacing the schools with new polling locations would be tough. Would 48 hours work better? I can't think of anyone that would be at work for 48 hours straight. Pfhorrest wrote: I hadn't considered the ability-to-prove-how-you-voted angle of it, but that aside, I am super in favor of voting by mail and think that should be the normal default way of voting for everyone. From what I understand, countries that introduced digital remote voting as the default actually have seen a drop in voter participation. I can think of any number of psychological explanations (removal of peer pressure, "I can do it later, oops too late", ...), though I'm to lazy to look up the reports right now. That sounds like the right of it, especially the accidentally-missed-deadline case. It's trivial to set up a notification to scream "OI, DOOFUS, 'ONE HOUR LEFT, VOTE NOW" at the 11th hour, but many would wind up not even doing that due to the common delusion that one can trust oneself to remember a thing and doesn't need a calendar notification. Pfhorrest wrote: With a paper ballot to mail though, you get an early reminder when it shows up in the mail, and then a constant reminder when it’s just lying around in the way until you deal with it. I'm all for paper ballots, but I'd also expect a lot of people to lose this sort of thing through procrastination. sonar1313 wrote: Plus, schools are very common voting locations and a week off school might make all the munchkins happy, but not the taxpayers paying to educate the munchkins. Or parents. Replacing the schools with new polling locations would be tough. For what it's worth, in my town they used the elementary school gym, and school was still in session all day. Granted, in many communities that would be considered a safety risk, but I imagine those are the same kinds of communities where they already have other public buildings handy. They used to use schools here too, but I think they had to stop because there were too many people under legal requirement not to get within a certain distance of a school. My current polling place, not that I've been there since they started allowing vote-by-mail, is in a church. There are classrooms attached, but I think they're only used for Sunday School. In my time I've mostly voted in my own original primary school*, when living one place, and a church that I've never otherwise set foot in when living in another. The original school buildings have been demolished and new ones rebuilt elsewhere on its original grounds since then, and I think they no longer host as a polling station (maybe for logistical reasons, easy public access to areas (that would be suitable polling-spaces) being designed out in the rebuild) as I know people still living around where I was now go to a temporary portacabin set up as a polling-station just off a junction at one end of the school's road. Other (smaller) permanent or temporary residences may have been used for other ex-school voters on other parts of the school's voting-catchment, or the single portacabin was still capable of handling the incoming voter-volume (without potentially having to fire up a school's entire heating systems just to cater for a slow trickle of adults heading for just one of dozens of otherwise empty rooms). When the school was the polling place, it was an off-day for pupils (with possible knock-on effects to working parents? ), so I can't rule out the wish to avoid that as an additional factor in the redefinition of polling space. * Displaced by the years it took to get from primary-age to voting-age, that is, which probably sounds more funny and/or confusing to people who talk about Voting in Primaries, like all y'all. On mail-in-voting: In our Austrian hair-thin far-right against liberal-with-far-left-influence presidental election, the far-right candidate won with 35 to 20 in the primaries, and lost by a miniscule margin in the run-off vote. Since in Austria nothing is ever done quite by the book, they found a reason to do a rerun. Since mail-in votes have a clear bias towards liberal parties here (or rather, towards "not far-right"), they were also trying to change the voting system to remove mail-in voting altogether. Not that it what be democratically questionable to change the system in the mittle of an election to favor yourself or anything... Thankfully, at that time they didn't have the legislative power to go through with it. It didn't particularly help though, that the rerun had to be shifted, because somehow the mail-in envelopes for the re-election had defective glue... ("gluegate"). Or that, when I knew I had to be out-of-town on election day for the last EU parliament election, my mail-in ballot card was never delivered. In that case I was mostly annoyed, because the EU elections traditionally are not being taken seriously, which in turn is used to push unpopular legislation on the European level, and then blame the EU for being forced to implement an unpopular law. Quizatzhaderac wrote: Even in old biblical times people would hire foreigners to do things. Also, I think only specific types of work were forbidden; which was most types of ancient work, but not all. I don't think that absolute sabbath is a good thing, or to be cunning like the Jews who buy a street to make it private ground and to cunningly allow some work is good. Everybody should have a day off, and it should be a day for picnics with wine and bread. Mark 2: 27 The Sabbath was made for man, not man for the Sabbath. 28 So the Son of Man is Lord even of the Sabbath.